When I was a kid, we used to go fishing with my uncle. We caught mainly perch, which were pretty easy to catch in Lake Michigan. Since there was much more catching happening than there was waiting for a bite, it made for a very fun day. We learned how to bait our hooks, how to cast, how to unhook our catch, how to string it up on a line. I got out of learning how to clean the fish, but I don't think my big brother was so lucky. There were enough fish to keep busy and feel successful, but still it felt like a little bit of luck and a little bit of skill when you did catch one. Where we camp every summer, there is a creek that is stocked with ... umm, I think trout? (I am not a fisher, and I am definitely not well versed in fish species). Anyway, the creek is stocked with fish on a schedule, meaning that the fish are deposited at specific spots, on specific days, at a specific time. In other words, if you want to catch a trout in this creek, you go to the spot where the fish have been released, just after they are deposited there. It makes it pretty easy to catch a fish, since you know that there are tons of fresh, befuddled, fish all in one spot. The poor little fish, who just came from a hatchery, gets to swim his little heart out in a big pool, for just a few minutes, when he finds a big juicy worm (or a smear of weird-looking florescent bait stuff) floating in front of him. He takes a big bite of this opportune treat, and some fisherman gets dinner. It hardly seems fair. It really doesn't seem like sport at all at this point. I really don't see how you can be proud of outsmarting a trout, let alone a trout that has been put there just for you to catch him. And that is sort of how I feel about eating meat. I am certainly not opposed to eating meat. I have no problem at all with consuming animal. I strongly believe the human is meant to be an omnivore. However, I also strongly believe in buying sustainable, fairly-treated meat. It doesn't really seem fair, though, to raise a chicken or a cow in a box barely larger than himself, and then march him up the chute at the slaughter house. There are so many things wrong with that. I know that even if a cow is raised in an open field, eating and drinking a natural cow diet, and getting natural cow fresh air and exercise and a real cow life, he still doesn't stand a chance. He is still going to be forced to the slaughter house. Short of making myself a bow and arrow and heading out to the plains, I can't think of a way to make it a fair fight between myself and the animals I consume. However, some time passes between a cow's birth and his slaughter, and it seems like he ought to at least enjoy the life he does have. With the abundance on vegetables, and the price of free-range organic meat, there are far more vegetarian days in my house than there are meat days. 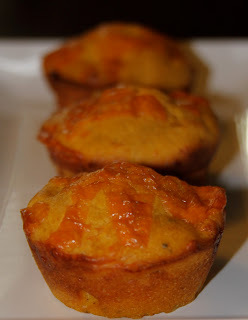 Tonight, we are eating a pot of vegetarian chili, along with these butternut squash - cheddar muffins. 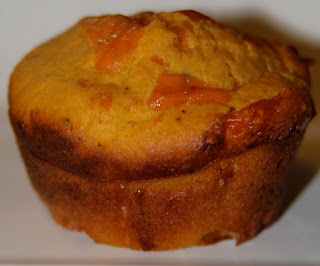 It was originally a pumpkin muffin, and I got the recipe from A Sweet Swiper, and she got the recipe from Chocolate and Chakra, and she got them from the book Baked Explorations. Rather than make you backtrack through all that, and since I made a couple changes, I am going to just give you my version of the recipe here. These muffins are delicious! The squash and the sugar add some sweetness, but the cayenne, black pepper, and sharp cheddar cheese balance them with a punch of spice and savory-ness. They make a perfect side dish with chili, soup, or stew. And while we are on the topic of butternut squash, look for lots more recipes this week! I got a butternut squash the size of a hippopotamus, and with it I made these muffins, 5 loaves of "pumpkin" bread, a batch of "pumpkin" waffles, and a batch of "pumpkin" cupcakes. Phew! Preheat oven to 400 degrees F. Lightly oil a 12-cup muffin pan. In a large bowl, whisk together the squash and yogurt. Add the eggs and butter and whisk until combined. In another large bowl, whisk together the flour, baking powder, cayenne pepper, salt, black pepper and brown sugar. Add the wet ingredients to the dry, and fold until just combined. Fold in three-quarters of the cheese. Divide the batter among the muffin cups. Sprinkle the remaining cheddar on top of the muffins. Bake them for 20 minutes, or until golden brown. Let the muffin pan cool on a rack for 10 minutes before turning out the muffins. Serve them warm. Makes 15 muffins. happy birthday to a happy happy guy.